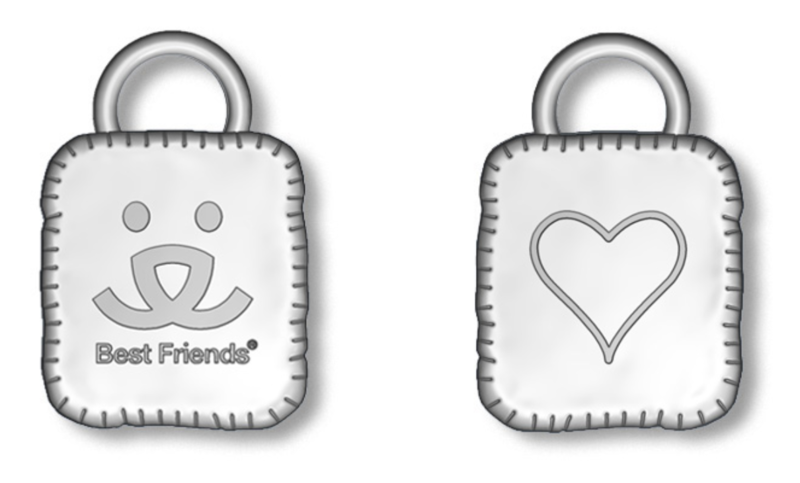 NEED: Best Friends Animal Society has been a client of Charity Charms for many years and we have created multiple styles for their events, membership drives, online store, and retail store. 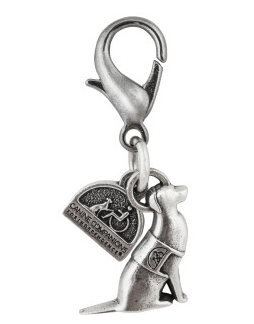 They wanted a NEW updated charm line that looked more “organic” to appeal to their pet focused supporters. The new jewelry line would be launched as a Mother’s Day campaign via online sales, social media, and a featured ad (shown to the left) in their monthly newsletter. Product Details: Focusing on an “organic” look and feel we created a series of hand tumbled pewter charms with Best Friend’s logos and mantras. A delicate 24” pewter chain was chosen to set off the charms and allow them to float together beautifully. To tie in their brand colors we added stone dangles in carnelian (orange stone) and crystal. Magic! NEED: Liberty Wildlife had just opened a beautiful new facility with a gift shop in the foyer. They needed unique items to sell at the gift shop, events, and, AND to feature at their 1st annual Unique Boutique. 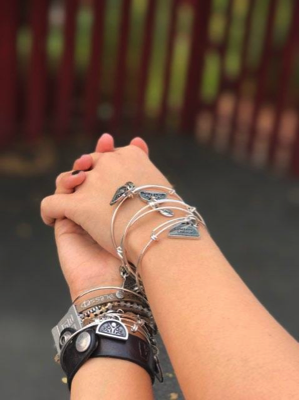 Product Details: We created five stackable stone bracelets with five different charms (Liberty Wildlife logo charm, OWL charm, Birdprint charm, a Wing charm, and an Owl Head charm. Each charm was attached to handmade stone bracelets representing the colors of the wild birds at the sanctuary. Finished in burlap bags with custom descriptive tags. Liberty Wildlife’s mission is to nurture the nature of Arizona through wildlife rehabilitation, natural history education and conservation services to the community. NEED: The Salvation Army was looking for a substantial and meaningful item to gift to all the donors, volunteers and supporters that help them “DO THE MOST GOOD” throughout the year. As an international organization with multiple services they needed something that was unisex and reinforced their brand and message. Product Details: The logo GivingBands we create for the different territories can be customized with their own branding bead or campaign message. The 24 HOUR HELP bead shown above can also be used on the bracelets for Disaster Recovery efforts and Addiction Recovery. It’s much easier to wear a band with a phone number than to carry a card that gets easily lost. 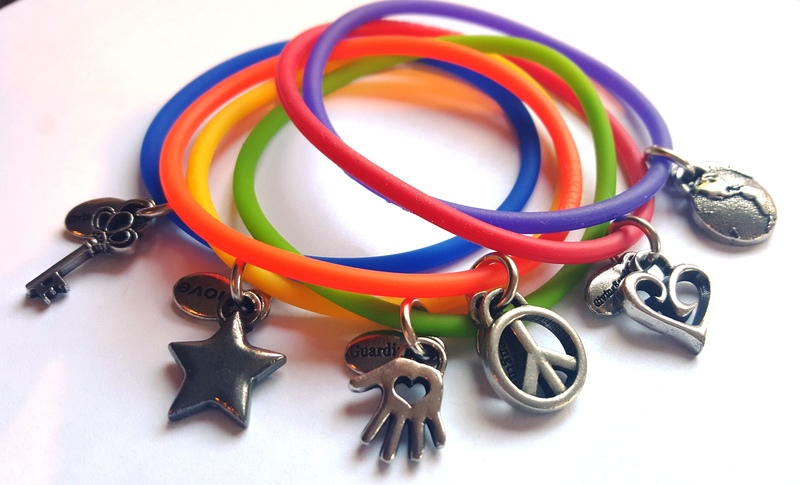 NEED: CADCA came to Charity Charms to design a bracelet that would define their brand and thank members when they signed up to support the organization. It was used at their annual conference, then as an oline tool to engage new members. 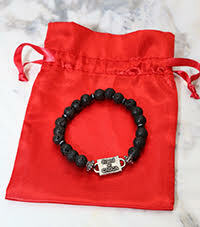 Product Details: Unisex Black lava stretch bracelet with reversible pewter charm, presented in red satin bag. The mission of Community Anti-Drug Coalitions of America is to strengthen the capacity of community coalitions to create and maintain safe, healthy and drug-free communities globally. This is accomplished by providing technical assistance and training, public advocacy, media strategies and marketing programs, training and special events. NEED: Kia Bess came to Charity Charms to design a branded necklace to help launch her new concept: She’s Trending. She wanted a versatile item that was designed around a shoelace to tie into her message of “Being In Her Shoes”. The necklaces are available for purchase on her website and as thank you’s and incentives to engage supporters at events. Product Details: A 36” Black cord shoelace with metal tips. 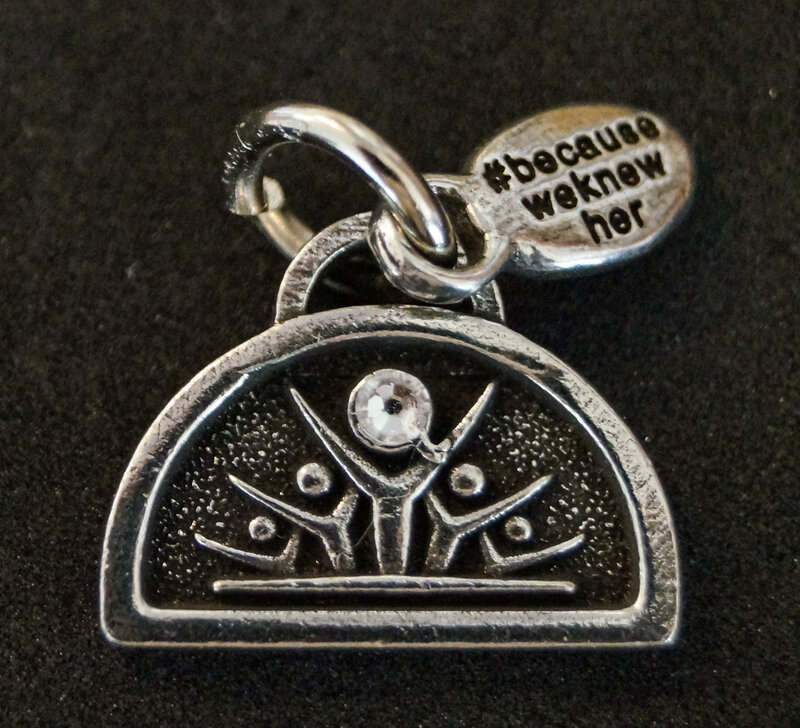 We created a charm from her logo and a branding bead that says “In Her Shoes”. The necklace is knotted on both ends and the charms hang off one end. It can be worn long, wrapped around the neck or wrist, as traditional shoe tie, and bag decoration. SEE EXAMPLES HERE. She’s Trending puts people first because they’re on a mission to bridge the gap with educational storytelling and media based programs. Their Street Team also known as their tribe not only wants to learn more, but they want to be more by connecting with leaders, influencers and mentors that impact their community from the ground up. 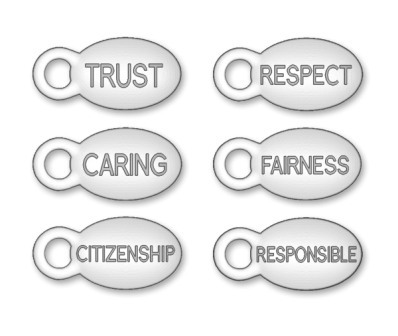 NEED: Character Counts came to Charity Charms to design charm bracelets using symbols that would tie into their six pillars of character building. The bracelets were used throughout their organization as a Character Building tool. Product Details: We used popular symbols already in the Charity Charms line coupled with colors that matched their pillar. A WORD branding bead was coupled with each symbol, then on custom descriptive cards. Character Counts’ mission is to improve the ethical quality of society by changing personal and organizational decision making and behaviour. NEED: Canine Companions was launching a new campaign called “GIVE A DOG A JOB” . They had much success with their logo charm and wanted to try a new charm and item to brand the campaign. They are using them for online sales, incentives, and gifts. Product Details: A large lobster clasp was used to create a “Clip On” Collar Tag that could be used on a Dog’s Collar, As Purse Charm, as a Zipper Pull , and even a pendant. 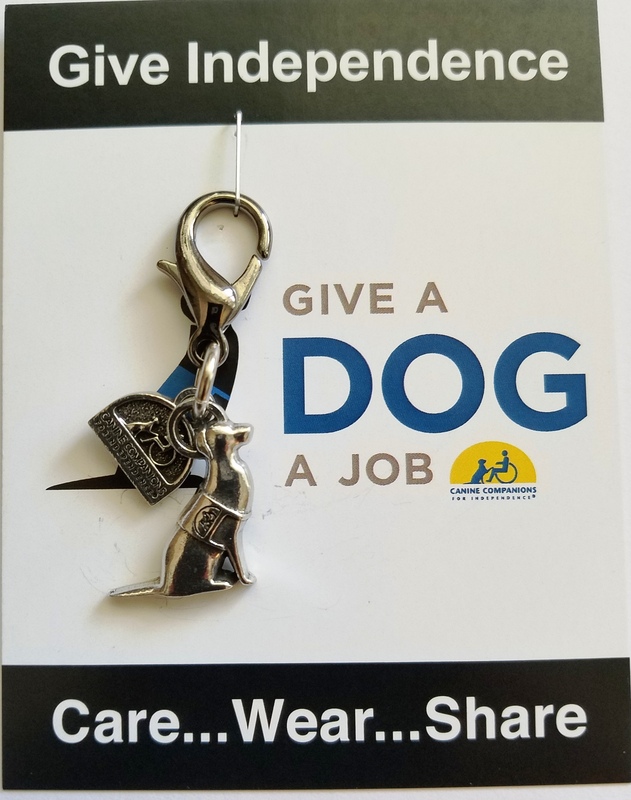 The Tag features two charms: The original Canine Companions logo charm and their new 3 D “GIVE A DOG A JOB” charm…the two coupled together doubled the branding impact. NEED: Joan Leafman, the Founder of Corbin’s Legacy started a non profit to leave a legacy for her daughter Corbin, whom she lost to cancer. In order to honor the work and kind heart of her daughter she had created a beautiful logo to brand the organization. 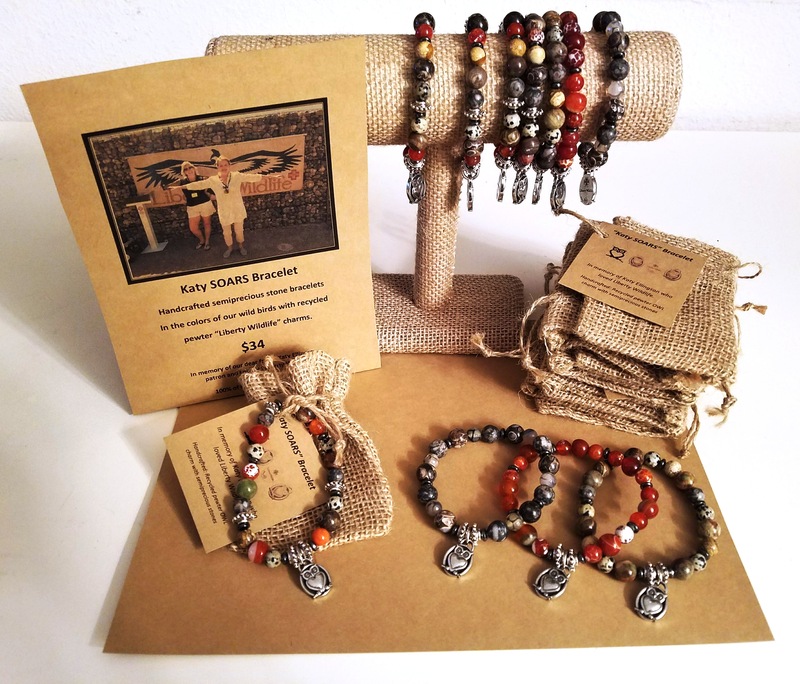 Joan came to us requesting a full jewelry line to use as a fundraising and awareness vehicle to sell in her online store and at nationwide retailers. 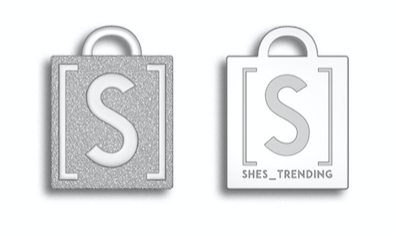 Product Details: We took her beautiful logo and made a pewter charm with a clear crystal in the middle of the central figure’s head to “Sparkle and Shine” like Corbin had. Then we made the charm into four items: Necklace, Keychain, Bangle, and Bag Tag. 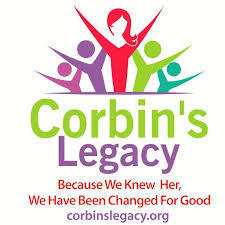 Corbin’s Legacy’s Vision is to have Corbin’s compassion and generosity live on by continuing her endless good deeds for children & families in need. 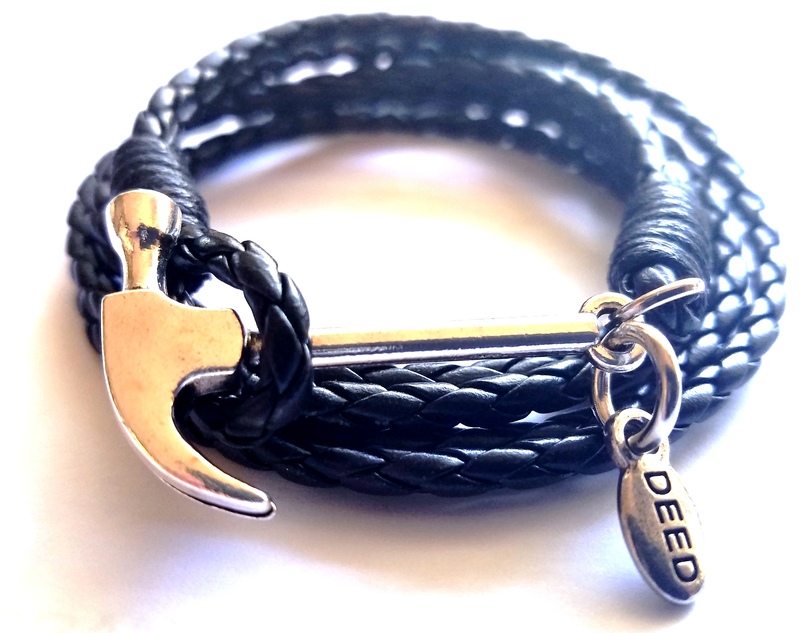 The Hammer bracelet was created to celebrate and commemorate the life of Andrew Derwin. 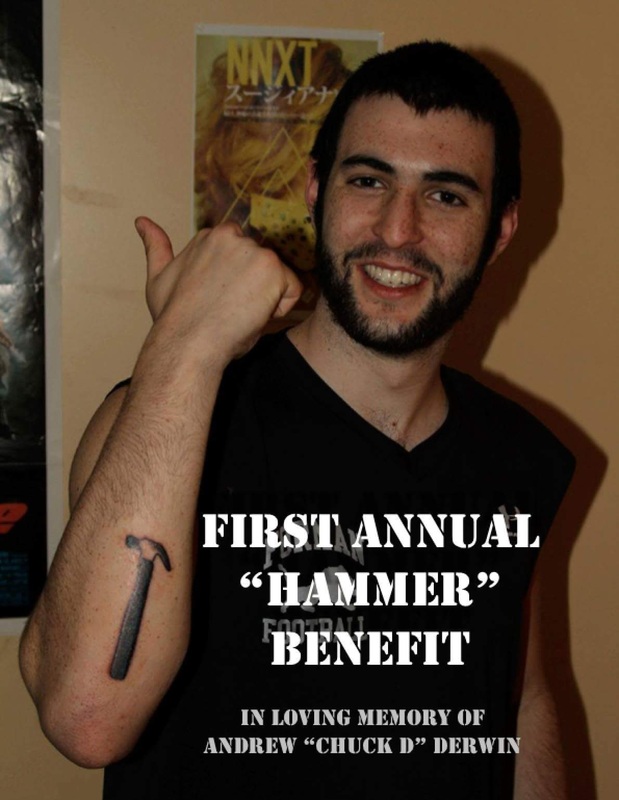 His famous “Hammer” tattoo was the inspiration for the charm. Family uses the bracelet as a thank you for donations online and at events. NEED: WomenHeart was having their 16th Annual Symposium, an event where their “Champions” and Board members all gather for training, support and comraderie. Executive Director, Mary McGowan, engaged us to create a meaningful and wearable takeaway for the new “Champions” inducted into the program. As a longstanding client of ours for over 14 years, we were delighted to come up with a new item for them using their gorgeous HEART LOGO charm. 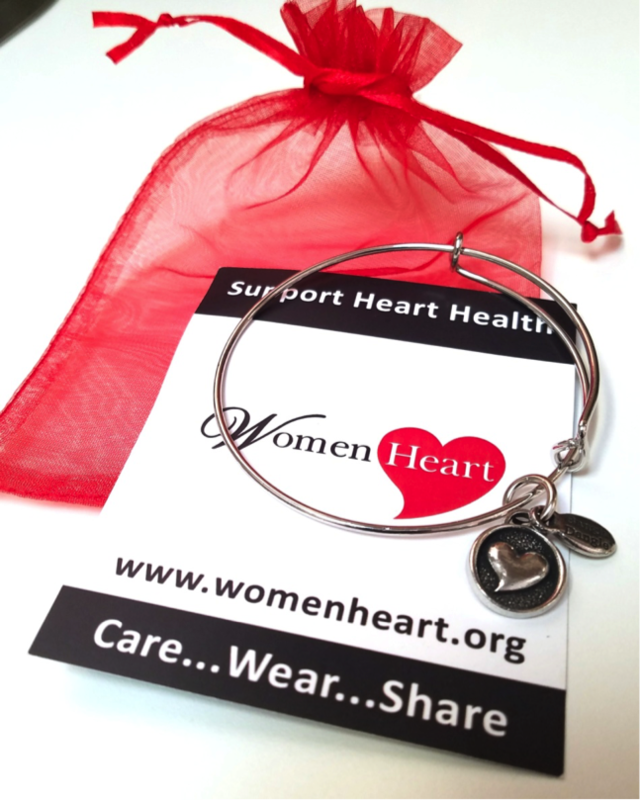 Product Details: A Silver colored adjustable bangle bracelet featuring their Heart Logo charm, branding bead and a custom message card. Each bracelet was inserted into a red organza bag for the finishing touch on the perfect gift. WomenHeart: The National Coalition for Women with Heart Disease is a nonprofit, 501(c)(3) patient advocacy organization with thousands of members nationwide, including women heart patients and their families, health care providers, advocates and consumers committed to helping women live longer, healthier lives. WomenHeart supports, educates and advocates on behalf of the 47 million American women living with or at risk of heart disease. 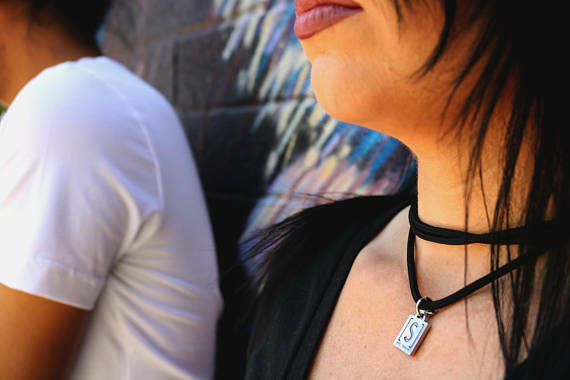 Now that you have seen Charms in Action, visit our product page to learn more about Charity Charms’ line of custom logo jewelry and accessories. Already have a plan? Order the sample kit! CharmStorm: Brainstorm the ways charms can change the world with a sample kit. 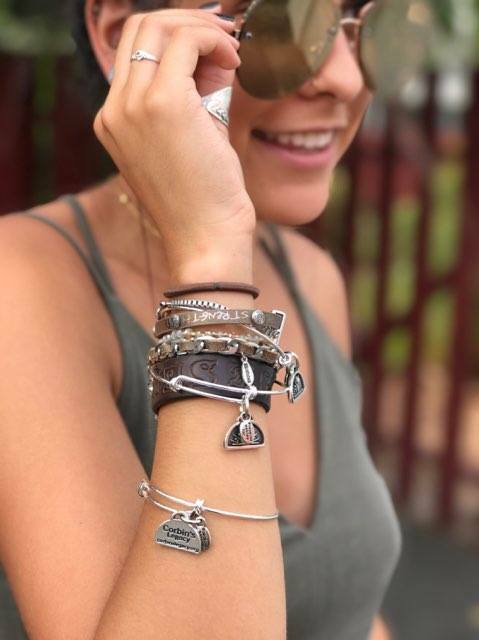 Touch and feel the quality of our charms and see for yourself all the fun, customizable options we offer. 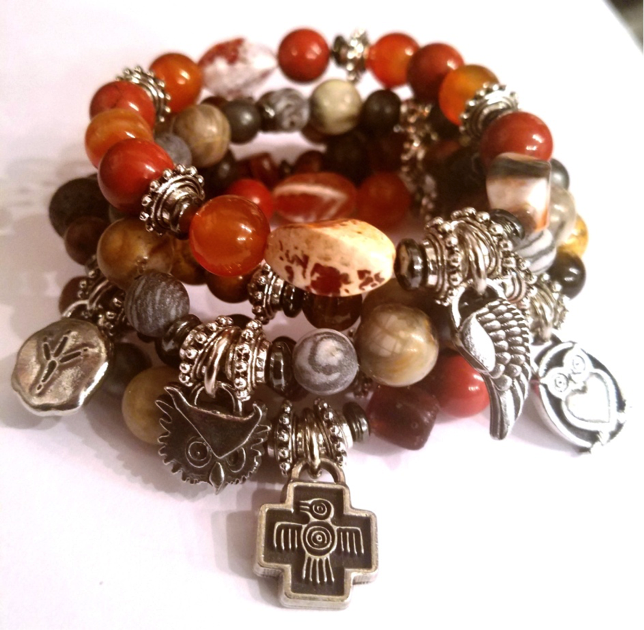 Included in your kit are our best selling bracelets (GivingBands, Bangle Dangles, Charma Power) plus examples of symbol and custom charms. Plus: Line Sheets and Idea Sheets to help you in crafting your custom charm bracelet program. “Our March of Dimes GivingBands were a huge hit. We used them as welcome gifts at many events and everyone was thrilled to receive them. The branded bracelets looked great and were a super value for the price. Our chapter bought 500 and used them throughout the year to spread awareness.